15 May - 30 September. Camping du Poulquer is well located within 200 metres of Bénodet’s large sandy beach and just 800 metres from the town centre with its promenades, restaurants and shops. Family run with a friendly ambience, and very popular with a high level of returning campers, this is a pretty site with many trees and attractive floral displays. The 148 touring pitches are set away from the entertainment areas in a tranquil environment. They are on grass and are a mixture of flat and slightly sloping. Electricity (10A) is provided. The outdoor pool complex includes a large paddling pool, flumes and other attractions, plus a new covered pool complex. The nearby Iles Glénan are ideal for a summer daytrip and offer a small nature reserve and idyllic sandy beaches. 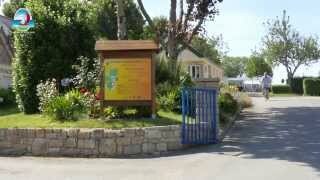 The site is in an enviable position, just a short walk from the beaches and town of Benodet, a seaside resort that has been popular with the British for many years. Nearby Quimper and the old fishing port of Concarneau are a must when visiting this part of Brittany. Sanitary facilities include some private cabins and provision for visitors with disabilities. Washing machine. Shop. Bar with snacks and takeaway (July/Aug). Indoor pool (15/5-15/9) with sauna, steam room and jacuzzi. 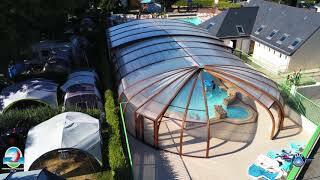 Outdoor pool complex with flumes (1/6-5/9).. Entertainment room. Games and play areas for children. Boules. Free WiFi in bar area. Travel east from Lorient on N165, take exit 51 on to D70 then D44 signed Fouesnant, and follow road to outskirts of Bénodet. After Bénodet sign, follow signs left for Letty, then turn right and follow signs to site on left.